In October 1582, Pope Gregory XIII introduced what we now call the Gregorian calendar. This is the most widely used calendar in the world, so the vast majority of calendar wristwatches display dates according to it. To what extent the calendar function is accurate from month to month greatly depends on the type of watch it is included in. Most advance the date at midnight, disregarding the different lengths of the months completely. Those fortunate enough to own perpetual calendars don’t have to worry about this at all because their watches will automatically correct the length of each month and even account for leap years. The downside, however, is that because of this they are highly complex to make – and therefore expensive. Don’t fret, though, because there is a middle ground between the most basic calendar watches and complex perpetual calendars: this is the annual calendar, which automatically adjusts for each month with 30 or 31 days, meaning that it only requires manual correction in February. Perhaps surprising to some, the annual calendar is relatively recent invention by Patek Philippe, and the first wristwatch featuring the new complication was the Reference 5035 in 1996. Patek Philippe decided to set its new annual calendar apart from its perpetual calendars by adding a practical 24-hour subdial instead of the moon phase found on the perpetual calendar. Over the years the annual calendar has become an essential part of Patek Philippe’s collection, benefitting from continual technical and aesthetical refinements. A moon phase was eventually incorporated as well, now found in the highly popular Reference 5146. This model honors the original design of Reference 5035 but has a more classical appearance due to the moon phase display instead of the 24-hour subdial. A power reserve indicator completes the displays. In 2016 Patek Philippe celebrated the twentieth anniversary of its annual calendar with the introduction of Reference 5396, which caters to more classically inclined clients by mimicking the design of a full calendar with the day and month indicated by means of two windows. Intriguing is also that the popularity of the annual calendar saw Patek Philippe combine it with other complications such as a flyback chronograph. This resulted not only in beautiful watches like Reference 5905 and Reference 5960, but also created something entirely new – what you might call a “light” version of the more traditional complications. While it wasn’t a perpetual calendar with split-seconds chronograph, it did combine two popular – dare I say practical – complications in a single watch at a more affordable price point. Patek Philippe patented its invention of the annual calendar, granting the brand 25 years of dominance with this unique complication. And those 25 years have yet to pass. And yet many other brands now have annual calendars of their own in their collections. These are neither patent infringements, nor did the brands compensate Patek Philippe for the use of technical designs. Because Patek Philippe was the first, the patent its engineers filed was rather specific, providing other brands with enough room to develop alternative movements achieving a similar result. While this ended Patek Philippe’s supreme, but brief, rule of annual calendars, it also played an important part in further popularizing the complication. The annual calendars from other brands not only introduced different designs, but some were offered at lower prices than Patek Philippe’s models. This didn’t push Patek Philippe completely out of the game: the brand was not only the first to bring out the complication it remains Patek Philippe, providing its watches a certain prestige that remains appreciated. Blancpain, for example, incorporated the annual calendar in a very unique way into its 2018 Bathyscaphe Quantième Annual, a diver’s watch. We can debate about the usefulness of the annual calendar complication underwater as well as the need for correctors in the case, adding risk by potentially compromising water resistance. But the reality is that the vast majority of diver’s watches hardly ever see water, while the style itself remains very popular. 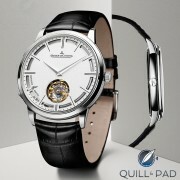 Omega integrated an annual calendar complication into its Aqua Terra line. While the Aqua Terra annual calendar is not a diver’s watch like the Bathyscaphe, it is still a reasonably sporty watch housed in a steel case. We also see here that Omega has an entirely different way of displaying the annual calendar functions, one that is similar to traditional day-date windows, only now the month takes the position of the day indication. Quite different is the 2016 Omega Globemaster, where the month is indicated by a hand that points to the different months placed between the hour markers on the dial. This sort of creativity ensures that there is an annual calendar for nearly every taste. And since 2018 there is also an annual calendar for every budget: Longines has given the annual calendar complication quite a boost with the introduction of the Master Annual Calendar. This is not only the brand’s very first annual calendar, it is also by far the least expensive mechanical annual calendar currently on the market. Priced at $2,425, it takes this function into regular date watch territory, which will most likely contribute considerably to further popularizing the complication. The current popularity of the annual calendar can quite easily be explained: it offers a distinct advantage over a regular calendar while performing only slightly below the level of a perpetual calendar as only the date need be corrected once a year. The price point of an annual calendar is more often than not considerably less than that of a perpetual calendar by the same brand. Add to this the technical coolness of the complication, and you have precisely what many people want. While a perpetual calendar is very often incredibly cumbersome to set, with many annual calendars it is usually a breeze, which means it isn’t necessary to keep the watch on a winder. Watch brands often also approach annual calendars like they are a new complication, giving them more refreshing design, especially compared to perpetual calendars, which are often very classic in terms of styling. Like the Roman emperors used to say: give the people what they want. Honourable mention should go to the annual calendar by ochs&junior, designed by Ludovic Oechslin. This design achieves the same function as all of the above mentioned watches … but uses only three (3) parts to do so. This, in my humble opinion, is true engineering genius. Via heron made a very nice triple calendar in 1942. How can this article omit the Rolex Sky Dweller?! One of the problems with calendar complications is that they clutter the dial – and who forgets what month it is? The Sky Dweller subtly indicates the month around the bezel. It also has a GMT function. This is the best annual calendar design in my opinion since it keeps the convenience of the complication without cluttering the dial. And the watch is not even that expensive as Rolex and annual calendars go. Thanks for your comment! This article was not intended as a complete list of all annual calendars on the market. Hi Martin, great article, but one small nit to pick: The Patek 5396 was introduced in 2006 with the railroad dial, and has been in production ever since. 2018 launch pictured in your article was a new dial with applied arabic numerals, not a new watch. A small but important nuance! Duly noted Mike, with appreciation!